Prince is now the sole owner of some of the greatest music he ever made, after Warner Bros. Records announced that it had reached an agreement with the pop icon to release the music that he created when he was signed to the label. According to the Associated Press, the two sides, once bitter enemies, reached the agreement late last week after years of court battles and disputes over music Prince made for Warner Bros. from 1978 to 1996. During that period Prince recorded some of his most influential works, including Purple Rain, 1999, Diamonds and Pearls and Around the World in a Day. 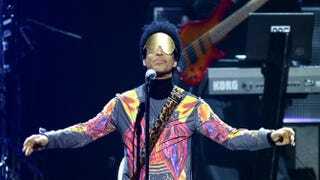 Financial terms weren't disclosed, but AP reports that the record label and his purple majesty will release "previously unheard material" produced during his tenure, including a 30th-anniversary edition of Purple Rain that is to be released this summer. Prince, 55, said in a statement viewed by AP that he's "pleased with the results of the negotiations" and looks "forward to a fruitful working relationship." The newfound agreement comes as a shock to many fans who watched Prince's relationship with Warner Bros. spill over into his work. Amid the long battle to own the rights to his music, Prince began performing with the word "slave" scrawled on his cheek. He changed his name from Prince to an unpronounceable image. When being introduced at shows, he was called "the artist" or "the artist formerly known as … " He also told the record label that he would rerecord all the music made during the years in dispute and sell the music himself. In 1996, after leaving Warner Bros., Prince began pushing music over the Internet. He had stints with both the Arista and Columbia record labels. In 2004 he won a Grammy for Musicology, and he has released many albums through his own label, NPG Records.